Top finishers for O’Neal are as follows: first place 200 Medley relay team of Alexis Coates, Natalie Williams, Hannah Burns and Lauren Millard in a time of 1:56.26, Hannah Burns first in the 200 Free at 1:57.65, Natalie Williams third in the 200 IM at 2:26.77, Lauren Millard fourth in the 50 Free at 27.68, Sierra Huffman seventh in the 100 Fly at 1:17.93, Alexis Coates tenth in the 100 Free at 1:03.06, Kaleigh O’Leary ninth in the 100 Free at 1:02.66 and Hannah Burns places second in the 100 Free at 52.68 breaking her own school record! Lauren Millard places fourth in the 500 Free at 6:18.21. Crushing the field by over four seconds was the 200 Free relay team of Hannah Burns, Kaleigh O’Leary, Natalie Williams, and Lauren Millard with the winning time of 1:49.20. Hayley Sager went from a seed of 22nd to placing 10th in the 100 Backstroke at 1:15.00, Kayleigh O’Leary placed 7th in the 100 Back at 1:09.79. Natalie Williams is fourth in the 100 Breast at 1:14.60 and the 400 Free relay team of Kaleigh O’Leary, Sierra Huffman, Hayley Sager, and Alexis Coates moved from 11th seed the 6th place and dropped over 20 seconds! The amazing races solidified the team’s victory! 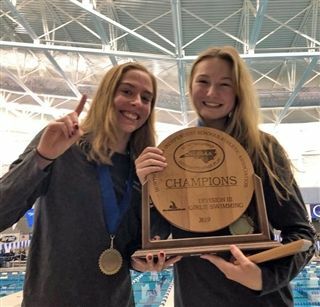 Since O’Neal’s 2A classification in 2001, the varsity girls swim team is now tied with the boys team in holding the title of state champion three times. For more information on the NCISAA Division 3 State Championships click HERE.